I am sitting here looking out the front window of the house we are renting, viewing Lake Cumberland. It rained yesterday in the AM, but cleared up so we could get out and about to explore the area. We found a National Trout Hatchery nearby, then the kids went fishing. It is nice to get away from the hustle and bustle of home, and the phones do not get good reception here, so they are quiet too. This morning, I am going to explore some antique shops and a craft 'coop' while Ray and the kids golf. While I am on vacation I decided to bring floss and crochet hooks with me to try to make crochet flowers in my leisure time. 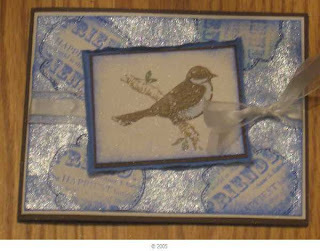 I found an excellent tutorial by Nichole Heady on her blog-with pictures-here is the link to her blog . My first successful crochet flower has been created using USA crochet hook size 3 and DMC floss. I will post pictures next week. 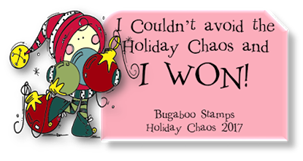 I CASE'D this from Jan Tink's blog ...I played in the Secret Sis Uno round on Splitcoaststampers, and this was a card to my 'lil sis'. I was assigned the same lil sis that was my Big Sis last round. She was so good to me, I tried to pour it on- she has such a great heart! 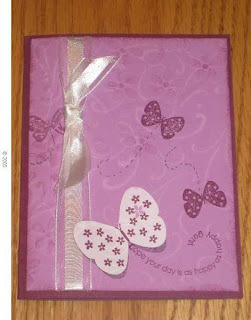 I enjoyed sending her cards and stuff....even tried my best at an altered address book. Her name is Rena (Ngrits), and I hope to stay in touch with her in the future. I saw this sketch challenge by ISC and wanted to give it a go. I used my skills learned in a Michelle Zindorf workshop- and the stamps I have used here are included in one of the sets we recieved from her to use at the workshop. They are from Innovative Stamp Creations and are called Art4Framesll. 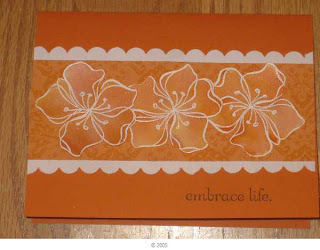 The Designer Paper in the BG has a similar flower, and I found it at Sassy Stamps- not sure if they still carry it- it is called basic Grey 'Boxer'. I used all SU inks: Soft Sky, Bordering Blue, NQN and Night of Navy, and Old Olive. I used Ruby Red on the tops of the flowers. The bottom of the Flower was used on the strip of Aged parchment below the image in Ruby Red. I got out the sewing machine to stitch around the edges. So, this month my partner is Nancy Horn- and she sent a card using the Double Bugging technique. 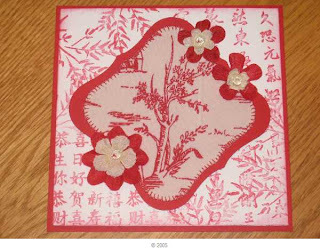 It is a technique I have not had the opportunity to try yet- what a wonderful card! I made a card from the current newsletter using a couple of techniques- one is called Scrappy Spots, the other is called torn frame. I also tried a technique by Sherril Graff using SU reinkers and Iridescent Medium- which is so shimmery- I used the reinkers with a stipple brush and applied to damp card stock just like you would if you were doing the Polished Stone Technique. Wow- this is super cool in real life! I colored the bird in with markers, and used Choc Chip, Creamy Carmel, Mellow Moss and used the Aquapainter to apply ballet Blue. Patty Bennett published a tutorial on how to watercolor the Roses from the 5th Ave floral on her blog. I just HAD to try this out, but did not have the rose set...that was then....Anyway, I used Embrace Life and made a card for my Secret Sis on SCS- I love this technique- Oh does it sparkle! Black Pearls was the very first card I made as a Technique Junkie- it just killed me to look at all of these beautiful cards on the internet and not be able to figure out how to make them, so I had to give in and join. Luckily, I made a few of these backgrounds......I used this BG I made a few years ago for the June 1-4-1 TJ swap. The stamp is TAC. My headers are all names of Techniques from the Technique Junkies...... This technique is from the current newsletter and I am finding it to be alot of fun. I made this for a wedding we recently attended- the colors were Silver, Black and Red. I added a little sparkle on her dress with a Sakura pen. One of my friends really likes Toile....I found a pair of pants at a resale shop, and went to town trying out this TJ technique. I thought it looked Asian, so I completed the card in an Asian theme. There are alot of variations to apply to this technique. I like the way it looks on all of the samples I have seen so far. This Technique is quick and easy- the Pierced Spotlight. It is quick and easy. My first attempt at using Copics was in December- am I crazy? I watched alot of You Tube video's and found the blog I have linked on my sidebar Ilikemarkers.....fabulous!!! This was really fun. The owl is a stamp as is the sentiment, the rest I used ripped paper and glitter. Bandana Technique and Paper experiment SU and G.P. This is from April of 2008, and the technique is called Waxy Cuttlebug. I made this for a stamper that asked me to exchange cards with her- she is very talented, so I really wanted to make something nice for her. I hope she liked how it turned out- i think it is quite fun. The waxy Cuttlebug is on the street under the truck. The rest of the card is watercolored. 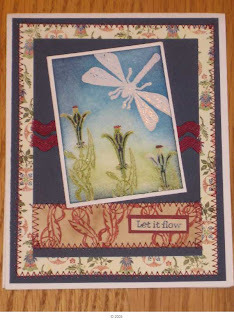 I signed up for a 1-4-1 swap after I had wrist surgery, and then the bone did not heal....so I grabbed this background I had previously made and found this flower I had previously made....and whipped up this card. I really like the way this one turned out. I am just highlighting some of my favorite cards or techniques from the past few years. This technique did not appeal to me at all- I am glad I gave it a try- it turned out very pretty IRL! It is called Cubist and is a Technique Junkies technique. It turned out like stained glass and looks like the embossed star is floating on the surface. 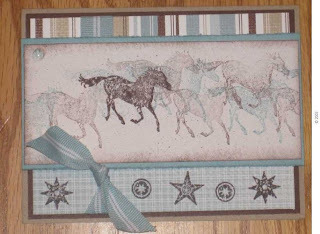 Here is a fun card I made for my husband for Father's Day a few years ago- this is a technique called Starburst- made with a brayer- I love the way this turned out and was created by putting my head together with my friend Nancy and her husband Bill threw his 2 cents in as well! My next try at a Technique Junkies technique is my all time favorite. I joined alot of swaps back in the old days- I had Anita Faul as a partner in a background swap. She made a Thank You background that was incredible. I modifies it to use for my parents 50th wedding Anniversary invite. It uses sentiment that is White embossed, then you do Polished stone in Creamy Carmel and Mellow Moss over the embossing, then reheat the embossing and it 'pops' back onto the surface. Next, I added metallic Rub ons. Perfect for what I needed. I am uploading some of my old favorite cards before adding any current cards. Most cards I make use Technique Junkies techniques- I love the challenge of trying new techniques. 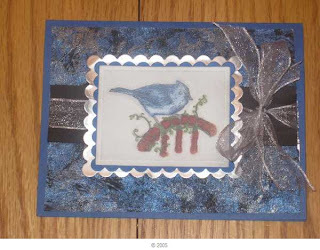 I also try to do the challenges on Splitcoaststampers when I have time, especially the technique and the Sketch challenges, I also enjoy the Featured Stamper challenge. The hardest one for me is the color challenge- which really stretches my abilities. I was so surprised at how easy it was to create such a nice card- I went to town and tried about 10 different colors, and Salt and Peppered all day- this was my favorite card though. 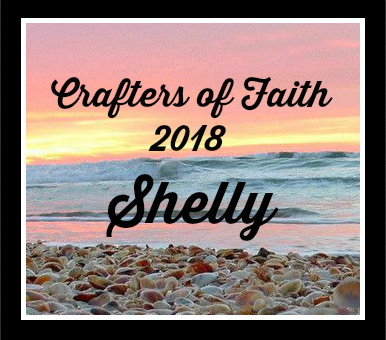 I have decided to start blogging to bookmark my card making samples and my other creative adventures. My 'other ventures would include embroidery and needlework, smocking, knitting and crocheting. I dabble a little bit in Scrapbooking, but most of my creative time is spent rubber stamping. 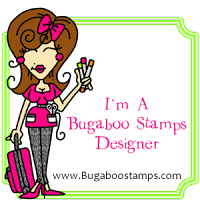 I hope to meet fellow stampers along the way and enjoy creativity with others.